SAHEL, Syria (AP) — Syrian government troops are tightening their grip on the last rebel stronghold near the border with Lebanon a day after taking control of a key village in the area, a field commander told reporters on Tuesday. Forces loyal to President Bashar Assad have seized a string of towns and villages in the rugged Qalamoun region along the Lebanese border since launching an offensive there in November. Backed by gunmen from the Lebanese militant Hezbollah group, the army seized the village of Sahel this week and is closing in on Yabroud, the largest town in the mountainous region still in rebel hands. The government operation aims to sever the rebel supply routes from nearby Lebanon and shore up its hold on the main north-south highway that runs through the area. During a government-led tour of the village of Sahel, a Syrian commander told reporters that troops ousted opposition fighters from the village Monday, bringing down the rebels' "first defense line" of Yabroud. The officer did not provide his name, in line with military regulations. Hezbollah guerrillas have played a significant role in the government push. The Lebanese Shiite militant is eager to clear the border area of the overwhelmingly Sunni Muslim rebels trying to topple Assad's government. Hezbollah claims that several cars used in recent bombings targeting predominantly Shiite neighborhoods of south Beirut have been rigged in Yabroud. Al-Qaida-linked groups have claimed responsibility for several of the attacks in Lebanon, saying they were retaliation for Hezbollah's military support for Assad. Opposition groups said fighting was raging Tuesday on the edge of Yabroud, with government helicopters dropping barrel bombs on the town's outskirts. The makeshift bombs, which the government has used to devastating effect in other parts of Syria, are packed with explosives and fuel and are intended to cause massive damage to urban areas. Rami Abdurrahman, the director of the Syrian Observatory for Human Rights activist group, said rebels fighting in Yabroud belong predominantly to hard-line Islamic groups, including the al-Qaida-linked Nusra Front and the breakaway group of the Islamic State of Iraq and the Levant. 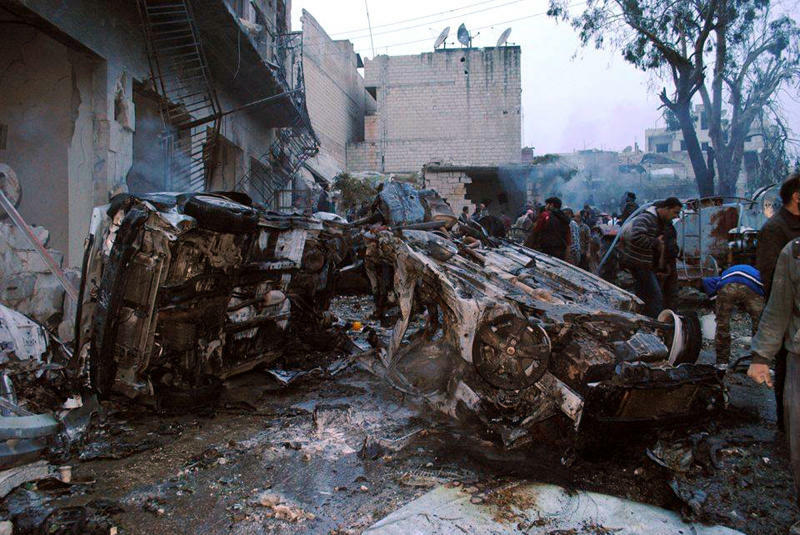 Syria's state news agency reported heavy fighting around Yabroud on Tuesday. It said the army destroyed a car fitted with a machinegun, and killed fighters from the Nusra Front and other rebel groups. The Syrian field commander said the army is determined to clear the area by launching a final assault from Sahel. He said "moral was high among the troops as they fulfill their mission" to capture Yabroud. Sahel was deserted on Tuesday as the government troops escorted reporters along. There was damage on several houses and a mosque, apparently from fighting, and telephone and electricity cables were torn from poles and strewn on sidewalks. At least one body could be seen on the ground. "It was a real battle and we didn't give the gunmen any chance to negotiate," the commander said. He did not say if the army or the rebels sustained any casualties, but said the troops detained more than 30 opposition fighters after capturing the village. Many of those captured were Syrians, the commander said, although there were also foreign fighters who had traveled to Syria from Saudi Arabia, United Arab Emirates and Lebanon to battle Assad's troops. In Turkey, a former rebel military leader was seriously injured in a car crash while traveling to the Syrian border, the opposition Syrian National Coalition said in a statement. His son was killed. Col. Riad al-Asaad, a former Syrian air force officer who defected and became one of the first leaders of the rebel Free Syrian Army, was in intensive care, the Coalition said. Al-Asaad was among the first to call openly for armed insurrection against Assad, although he was later sidelined in the rebellion. He was wounded in the foot a year ago by a bomb planted in his car.